The fall cool-down began here last week. But we knew fall was in the air more than a month ago, when the fall-flavor product samples started to arrive. Fall is perhaps the best season to get into the flavor spirit. As the choices of warm-weather fresh produce narrow, pumpkin, squash and foods flavored with “fall spices”—allspice, cinnamon, clove, ginger and nutmeg—give us something to look forward to. BREAKFAST: You can start the morning with pumpkin spice oatmeal, pancakes and muffins; spread your toast with pumpkin butter; and pop pumpkin marshmallows into your cocoa. Or, just grab a pumpkin scone and a pumpkin spice latte. BREAK: With your morning or afternoon “coffee break,” switch to Zhena’s Vanilla Spice Harvest Herb Tea or Republic Of Tea’s Pumpkin Spice Seasonal Black Tea, with a a pumpkin chocolate chip cookie or pumpkin biscotto. DINNER: There’s pumpkin soup, pumpkin pasta, roasted pumpkin alone or with other vegetables, rice, even in a green salad. And by all mean, have a pumpkin ice cream hot fudge sundae for dessert. We’ll save the pumpkin cocktails, crème brûlée, bundt cakes and pies for another time. Gourmet pumpkin baking mixes. At Sur La Table alone, there’s Pumpkin Spice Donut Mix, Pumpkin Spice Cheesecake Brownie Mix, Pumpkin Spice Chocolate Chip Cake Mix, Pumpkin Spice Whoopie Pie Mix and Buttermilk Almond Pumpkin Spice Quickbread, all nicely boxed and giftworthy. Pumpkin spice instant oatmeal from Quaker. Just add hot water, and 60 seconds later you’ve got a warm bowl of comfort. It’s OU kosher. Pumpkin pancakes: There are mixes on store shelves, online, and of course, at IHOP. Pumpkin spice peanut butter from Peanut Butter & Co. Blended with real pumpkin and pumpkin pie spices, at $6 a jar it’s great for Halloween and Thanksgiving party favors, too. It’s also available in a fall flavor three-pack, along with with Cinnamon Raisin and Maple PBs. Pumpkin spice syrup from Monin, to make your own PSLs at home (even a sugar-free pumpkin spice latte). TOP: Talenti’s Pumpkin Pie gelato contains real pumpkin and actual pieces of pie crust. 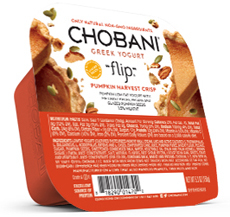 MIDDLE: Flip some Pumpkin Harvest Crisp into your yogurt. 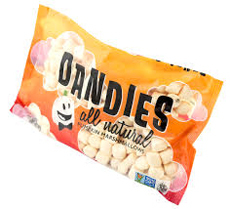 BOTTOM: Dandies pumpkin mini-marshmallows, vegan and kosher. 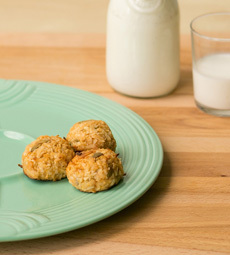 Pumpkin Spice macaroons from Danny Macaroons. Photo courtesy ScoutMob.com, which sells them and other tasty things. 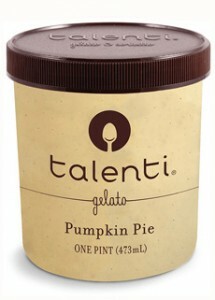 Talenti’s Pumpkin Pie gelato. While there’s a choice of pumpkin ice cream brands, Talenti’s pumpkin pie variation not only uses real pumpkin—it adds real pie crust pieces. There’s more to come, so stay tuned! But first note: Most of these are seasonal specials. Eat up!